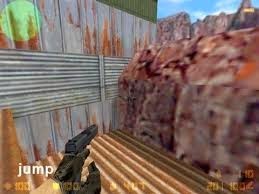 Still not able to climb red rock in de_nuke? The rock jump on de_nuke is one of the most rewarding abilities to have, as you can achieve one of the most advantageous positions on the map without relying upon your teammates to get you there. 1. Position yourself parallel to the rock on the T-side roof, facing CT spawn. 2. Press and hold "W" to begin running parallel to the rock. 3. Press and hold "D" to begin strafing right--you should start to move in a diagnol line. 4. Compensate for this movement with your mouse while you continue to move parallel with the rock. 5. Hit the spacebar to jump, acceleratingly flicking your mouse to the right at simultaneously, turning to face the rock. 6. Press and hold CTRL while mid-air to crouch.